Eagles Wings Gospel Music is a Ministry designed to encourage the Body of Christ to experience Gods presence through intimate praise and worship. 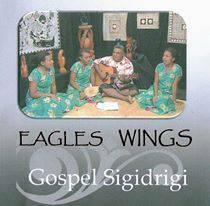 Eagles Wings Gospel is comprised of a group of family members in Fiji. They have five albums to their credit since debuting in 2004. They regularly play local gigis in Suva, Fiji, in particular at church events and music festivals. The group wears traditional Fijian custom clothing and performs energetic and moving performances to their audience. They are a household name and much enjoyed music group.